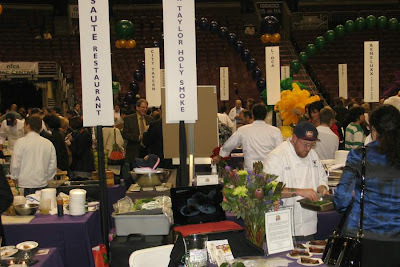 The sixth annual Appetite for Awareness, sponsored by the National Foundation for Celiac Awareness, brought 30 Delaware Valley restaurants and caterers together last Wednesday evening to share gluten-free cuisine with more than 1,000 attendees. The restaurants included past favorites such as Pasta Pomodoro and The Capital Grille and newcomers like Casona, Chifa and Zahav. At the VIP reception that kicked off the event, John Binswanger and his family were feted for their longstanding contributions to the NFCA. Binswanger is the chairman of Binswanger & Company, which manages major commercial building projects in the Delaware Valley and elsewhere. My older son and I covered a lot of ground that night, sampling our way through the concourse to the Marketplace section that covered about half the floor of the Wachovia Center. 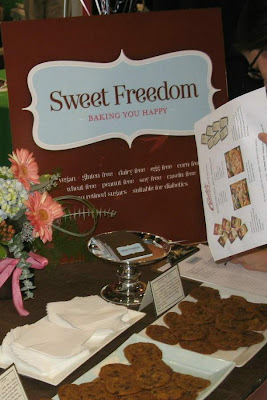 We chatted with Christine Ruggio of Sweet Christine's Gluten-Free Bakery in Kennett Square, Pennsylvania. Christine had mini frosted donuts that were better than anything made by Entenmann's. Before heading into the arena proper, we also sampled focaccia from Aunt Gussie's and several breads from Lancaster, Pennsylvania's Amaranth Gluten Free Bakery (formerly Spice of Life). While several vendors offered slices of gluten-free pizza, we were most impressed with the top-and-bake pizza shells from DeIorio's, made under its Violet Packing brand. Right now, the company's product is only sold at wholesale commercially, but hopefully they will distribute to the retail level soon. It was pretty cool walking on the floor knowing that the ice the Flyers skate on was just beneath our feet. We made a beeline for two vendors in particular: Shabtai Gourmet and Sweet Freedom Bakery. Our family has long been a fan of Shabtai's gluten-free cakes and cookies, which were originally made just for Passover. (Hello, Rainbow Cookies!) Due to the popularity of those products, the Itzkowitz family decided a couple years ago to bake its celiac-friendly wares year-round. We also met Sweet Freedom's Heather Esposito and Allison Lubert, who plan to open their gluten-free bakery on Philadelphia's South Street in early November. They sampled their chocolate chip cookies, which were so soft and chewy. Other local Marketplace participants included Caesar's Pasta, Conte's Pasta, Virago Baking Company, Dietz & Watson, Froose, Zukay Live Foods and Good Eatz. All of Dietz & Watson's meat and cheese products are gluten-free except for scrapple and bockwurst, and many are sold pre-packaged at area supermarkets to eliminate possible cross-contamination at the deli counter. 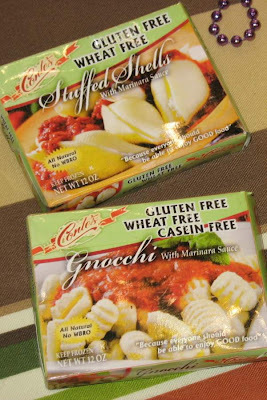 Conte's displayed packaging for the company's new line of microwaveable pasta meals. I was so happy for my son and other first-time guests to partake in this great event, which has evolved from a small reception in a private home to a convention of sorts for Philadelphia's growing gluten-free community. With its growing popularity, Appetite for Awareness should draw even more attendees and raise awareness of celiac disease even further in the years to come.